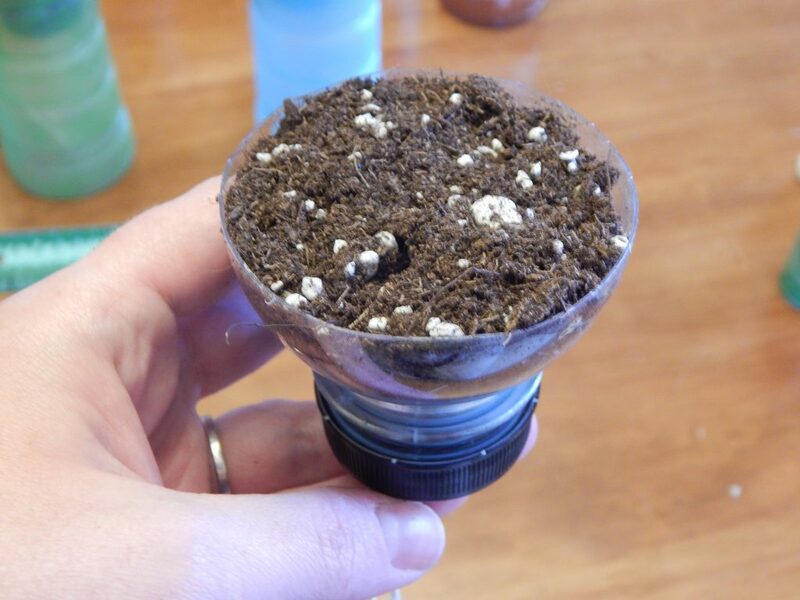 Are you looking for an awesome way to bring the outdoors in, or to celebrated Earth Day with a fun up-cycle project? Well I’ve got a perfect one for you! 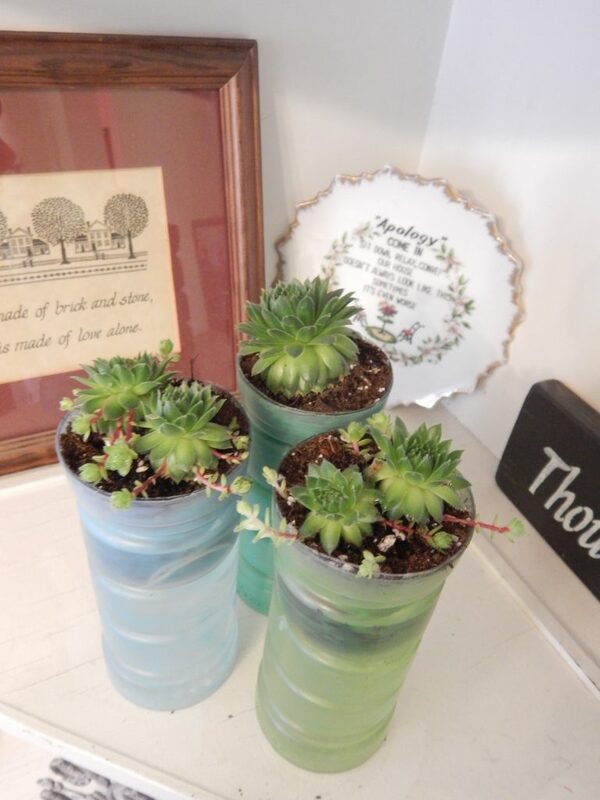 These planters are super easy to make, so cute, and perfect for filling with herbs or succulents! Let me tell you, I am so super excited that it is spring! There is something so wonderful about all the plants coming back to life, the beautiful flowers, and the sounds of the season that just makes you happy! One of my favorite ways to celebrate spring is to bring a little bit of the outdoors inside! I love picking tulips for a vase on my table, I have a vase of forsythia on my mantle, I love having the beautiful spring plants in my home! I’ve been looking for other ways to bring plants inside, but I need things that are low maintenance! I’ve recently fallen a little bit in love with succulents so I knew I wanted to create something to put them on display in my home! On a recent shopping trip I picked up several bottles of Honest® Tea. We love this tea, and the new Unsweet Ginger Peach flavor is perfect for someone like me who tries to stay away from sugar. Of course I had to get a couple of each flavor for the rest of my family they love it too! 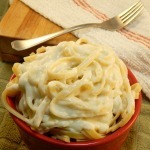 We love that it is “just a tad sweet” and tastes so much like homemade! The fact that it is fair trade and organic makes it even better. 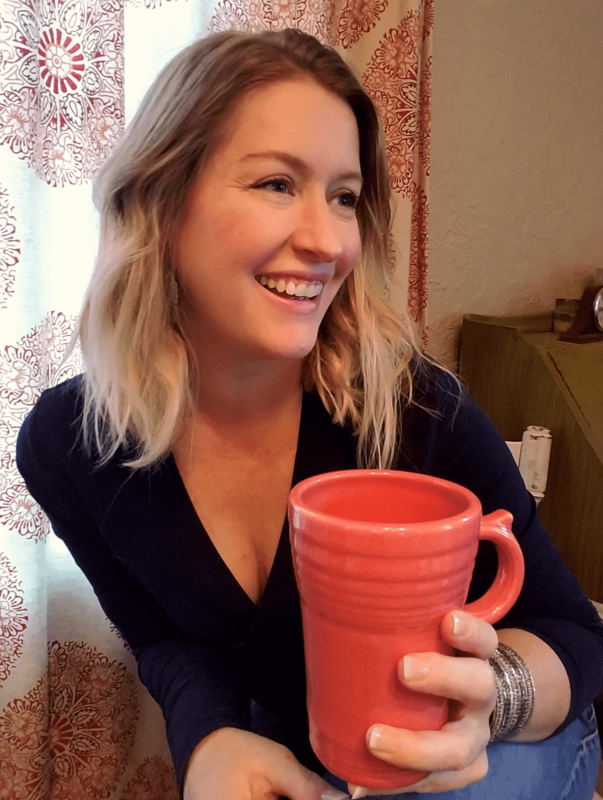 If you’ve been around my blog for awhile you know I love a fun up-cycle, and when I was drinking my tea I decided I wanted to do something fun with the bottle! 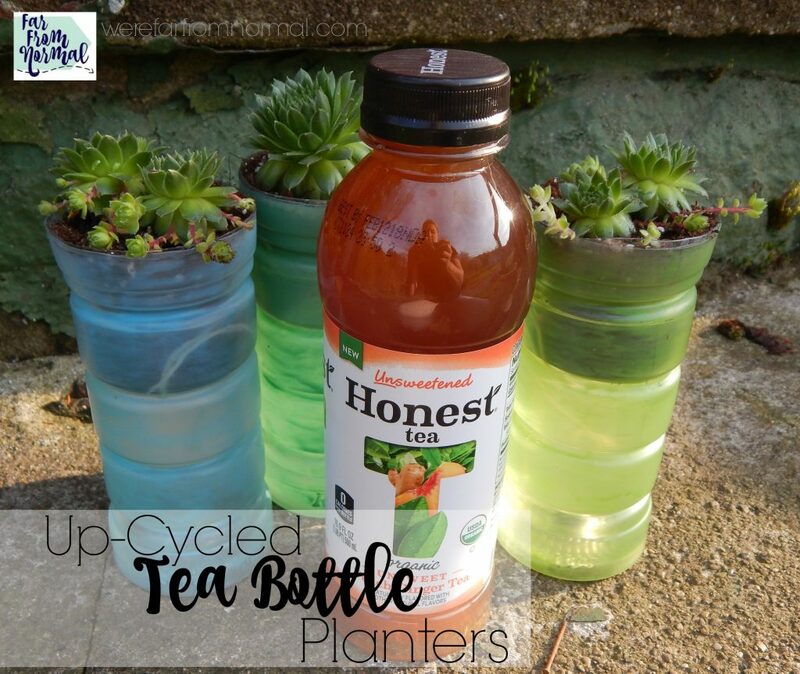 The Honest® Tea bottles are nice and sturdy, so they are perfect for crafting into something fun!! The perk of this project is that you have to enjoy your tea first! 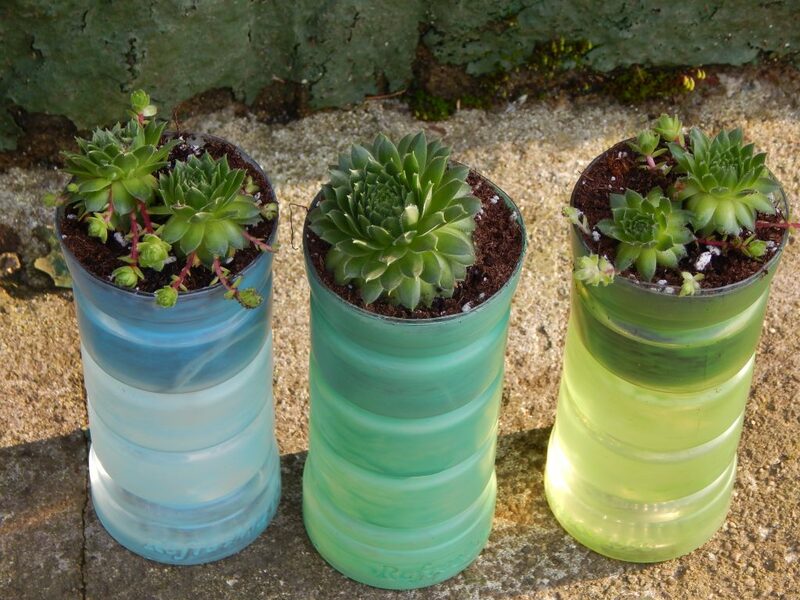 So save your bottles until you’ve got enough to make as many planters as you’d like! I used a technique to make the plastic bottles look like sea glass. I stuck with blue and green but you could make them any colors you’d like! 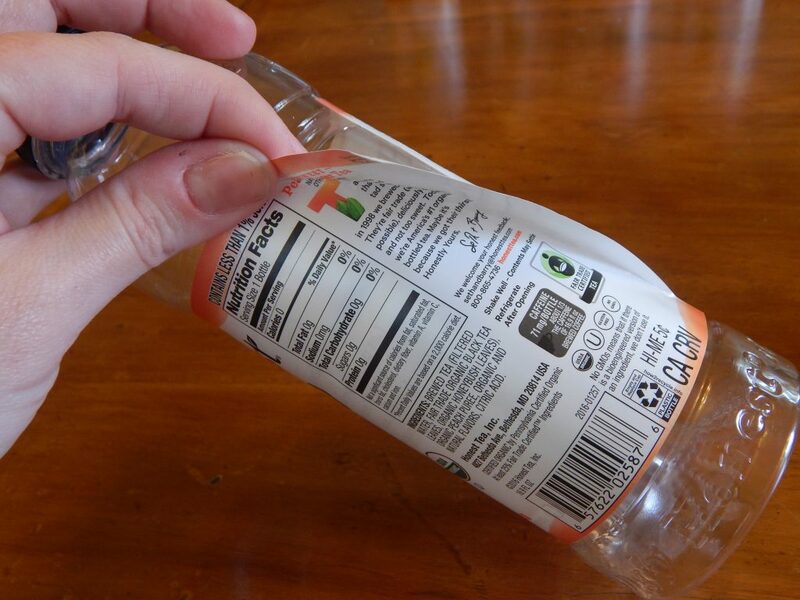 The first thing you’ll want to do is rinse out your bottle, then peel off the label. The good people at Honest® Tea were kind enough to make this super easy. Next you want to make it nice and clean. 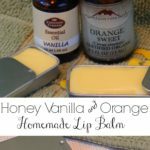 There isn’t a lot of glue, and a little goo-gone or lemon essential oil will take it right off. 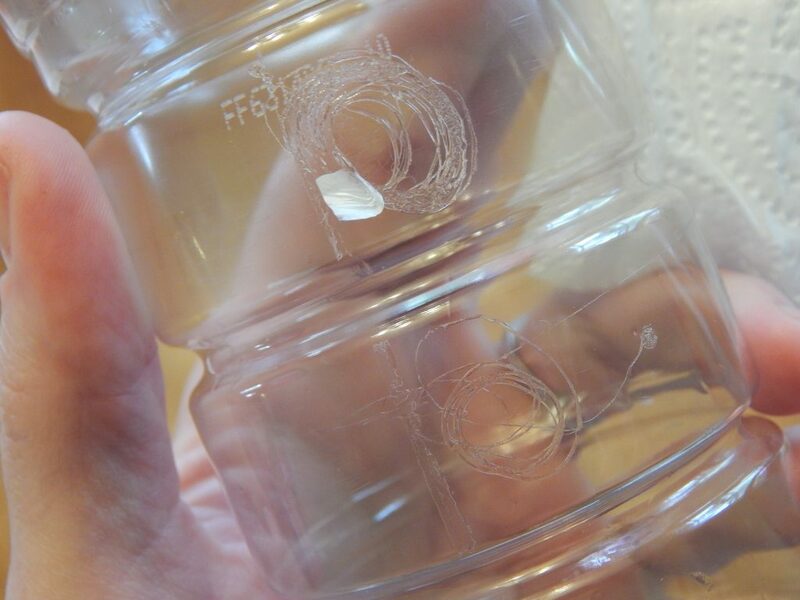 You also want to use a little bit of rubbing alcohol to remove the stamp on the top with the expiration date. 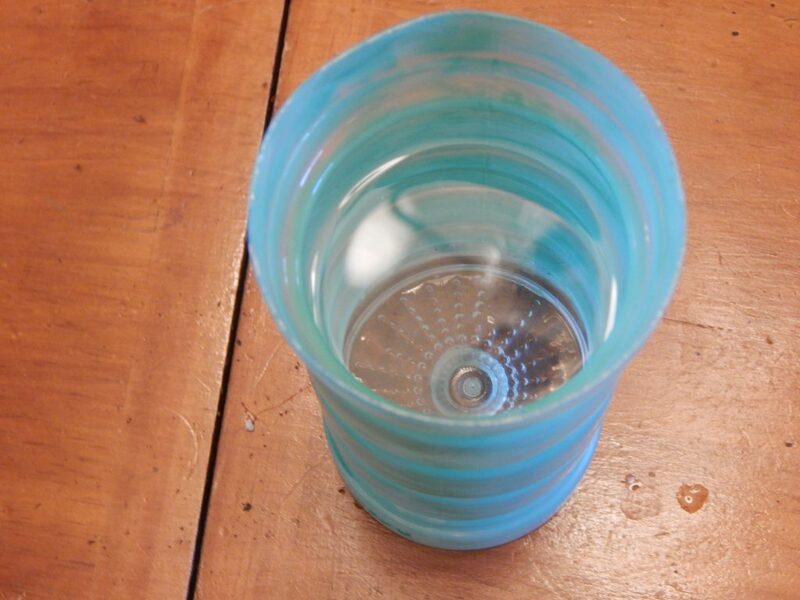 Now give it a good washing with a little dish soap so you have a nice clean bottle. 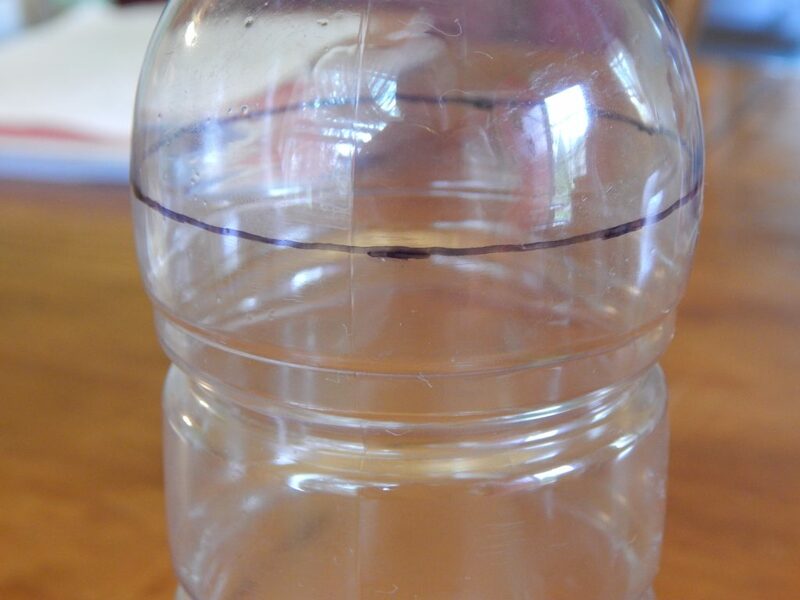 Now using a Sharpie you want to mark where you want to cut your bottle. Right above the top ridge you want to measure 1/2 inch and mark it. 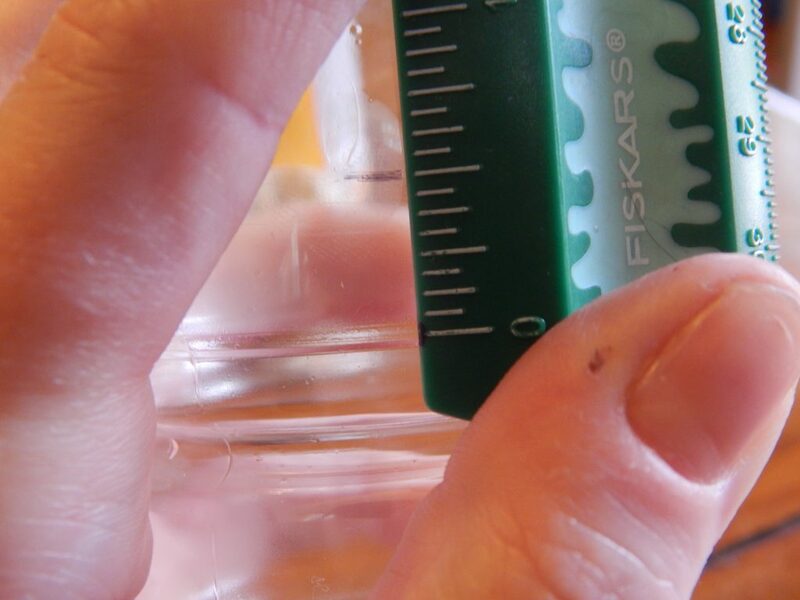 Make marks at even intervals around the bottle. Now play a little connect the dots so you have a nice solid line to cut on. Now using your razor blade or knife cut around that line. 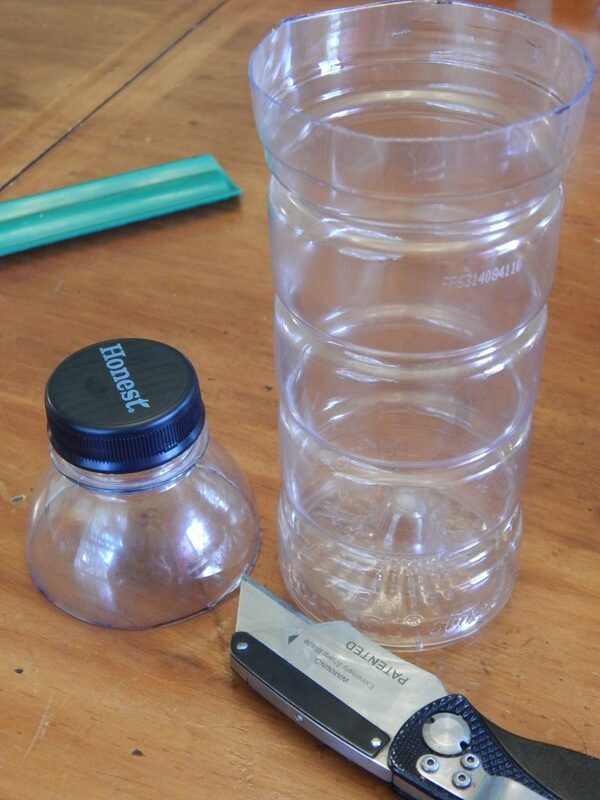 Once you’ve got it cut apart turn your top upside down and gently press it into the bottom part of the bottle to make sure it fits well. So what we’re going to create now is a little self watering system to make these nice and low maintenance. 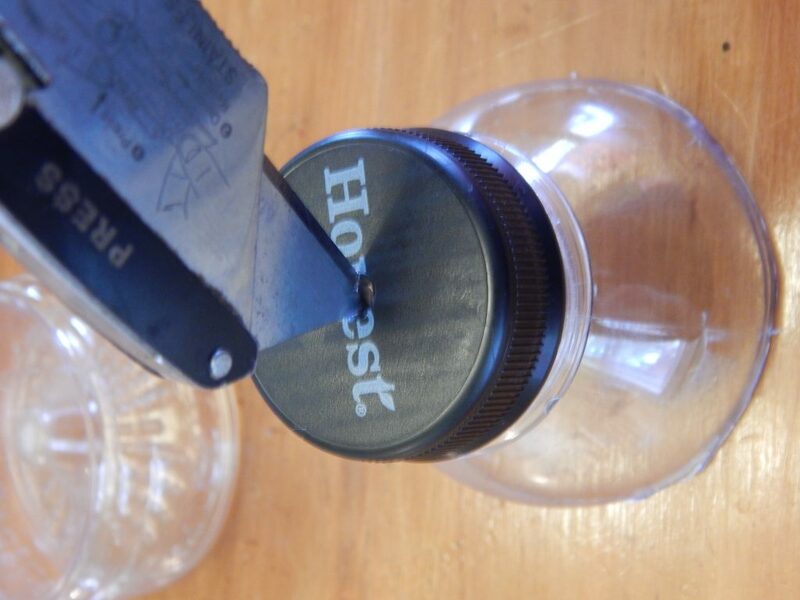 First you’ll need to cut a little hole in the center of your bottle’s lid. 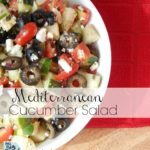 You can use your razor knife and just give it a little twist. Now take your twine and cut three- 8 inch long pieces. 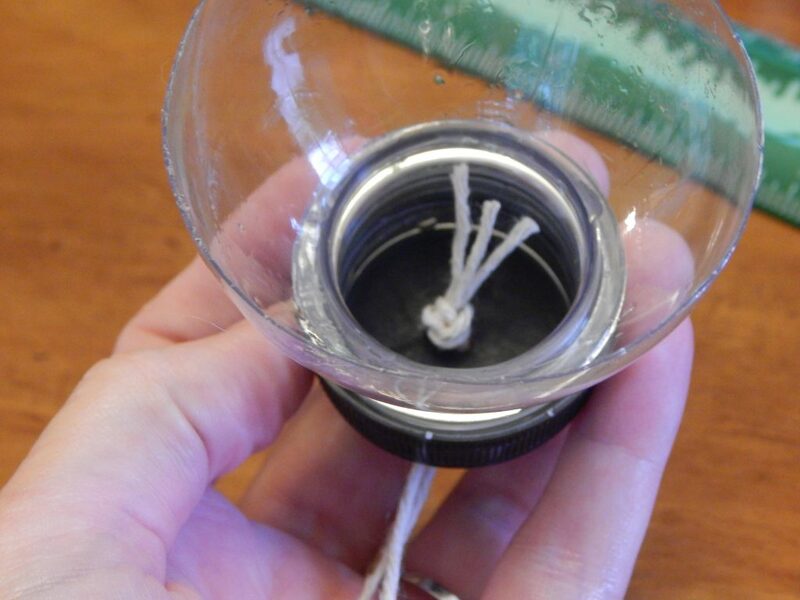 Tie them together in a knot and thread it through the hole in your lid, then twist the lid on. You can set that part aside for now, it’s time to paint the other part of the bottle! 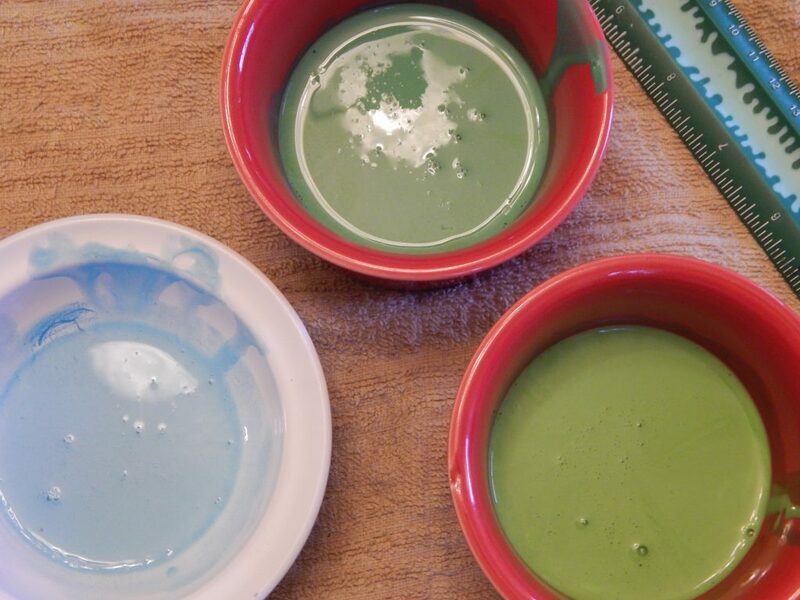 For this we’re going to create a mixture that has the look of sea glass when it dries, and it’s super simple to make! You’ll need a small container to mix in, squirt in about 2 Tbsp of your glue, no need to measure it doesn’t have to be exact. 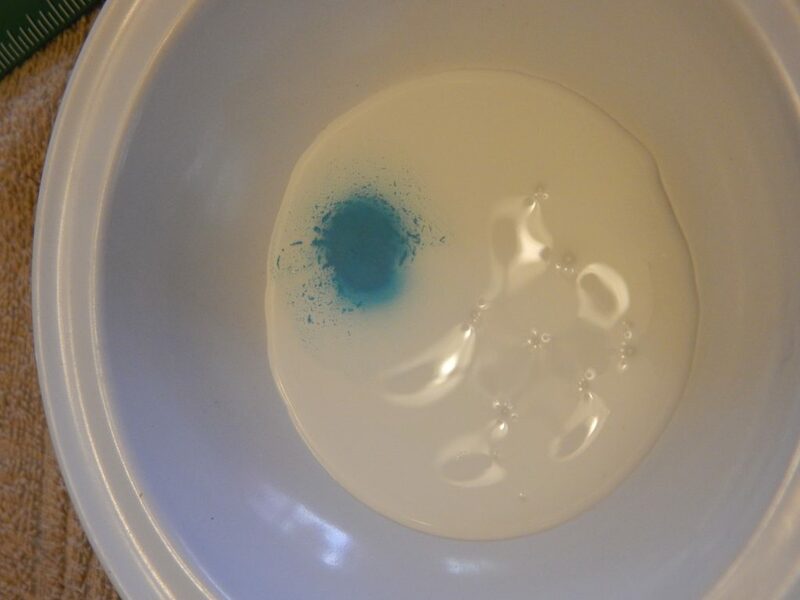 Now drop in a few drops of your paint. Give it a stir, and add a little more paint if you want a little darker color. I used blue in one, green in another and a little of both in the third. This is what they looked like just for referance. Now it’s time to paint. You want to work in small sections at a time putting on a thin coat. It may bead up in sections, just keep brushing over them until it sticks well. 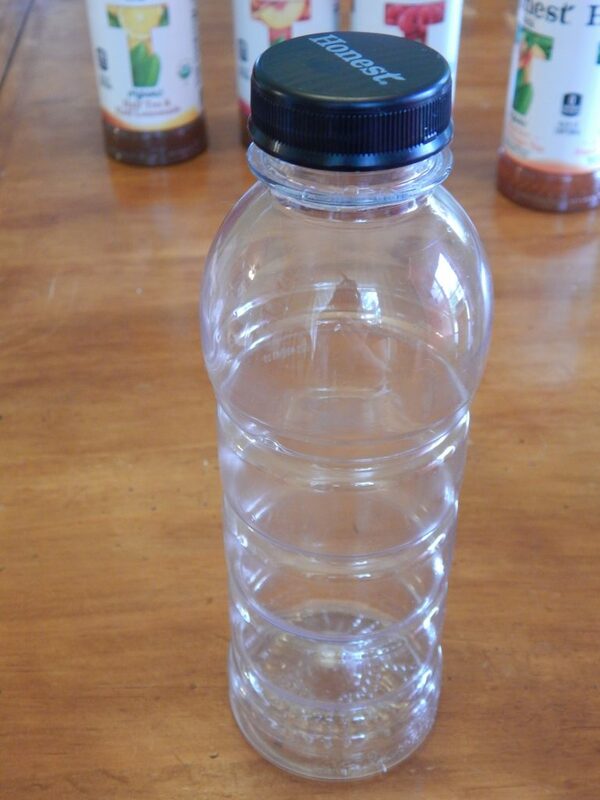 Keep moving over your bottle until you have it covered with one full coat. Let them dry completely and then add another coat and allow it to dry completely. Once your painting is complete you’re ready to plant! First fill your bottle with water 3/4 of the way full. 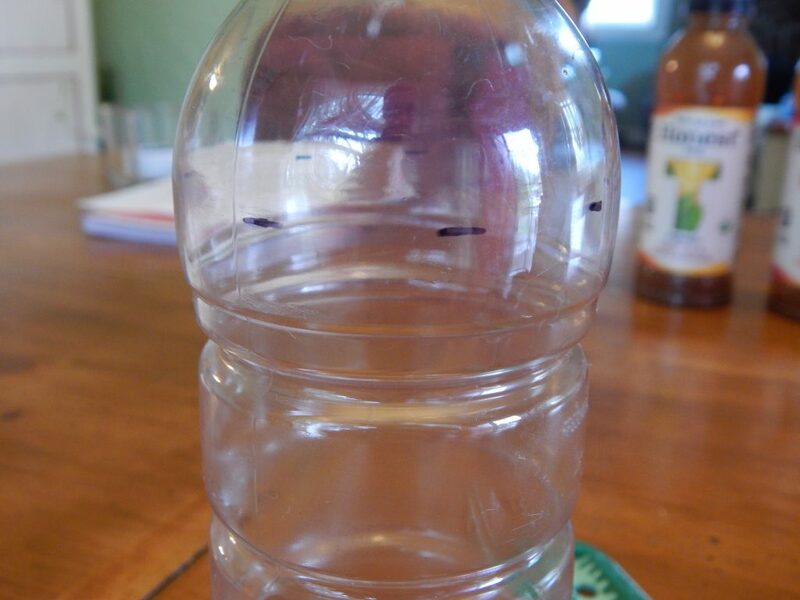 Now gently press your top down into your bottle, letting the twine go down into the water. Now add your plants or seeds. That’s it! You’re all done!! They are a perfect addition to your mantle, shelf, dresser or anywhere you want to bring the outdoors in!! 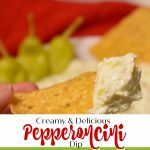 Are you inspired to make your own?? You can head to your local Kroger store (or other division of Kroger) and use a digital coupon worth $0.25 off Honest Tea, and you can use it 5 times! 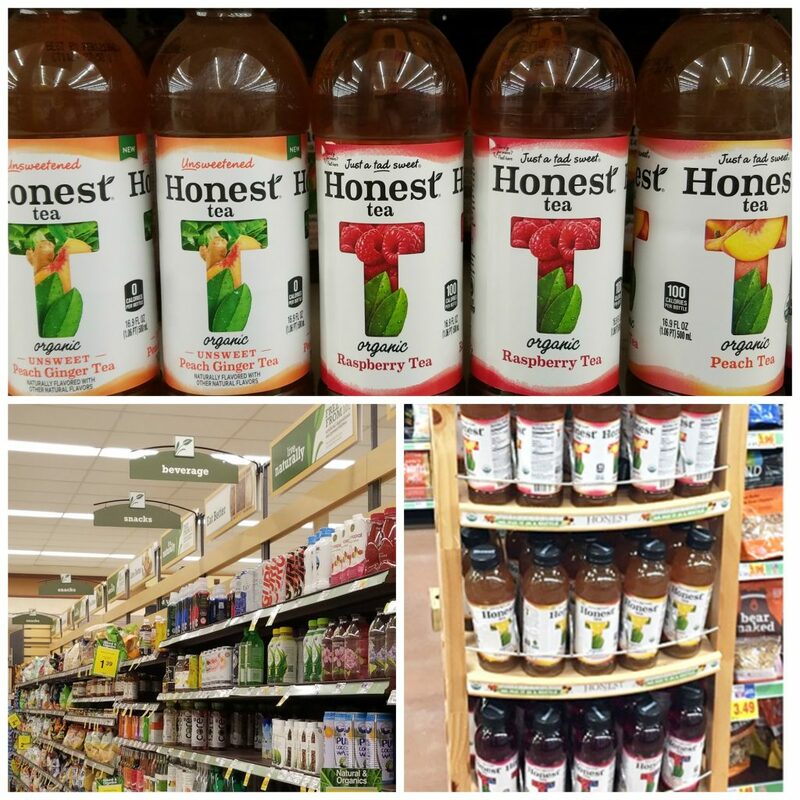 You can find Honest® Tea in the organic section where the beverages are! 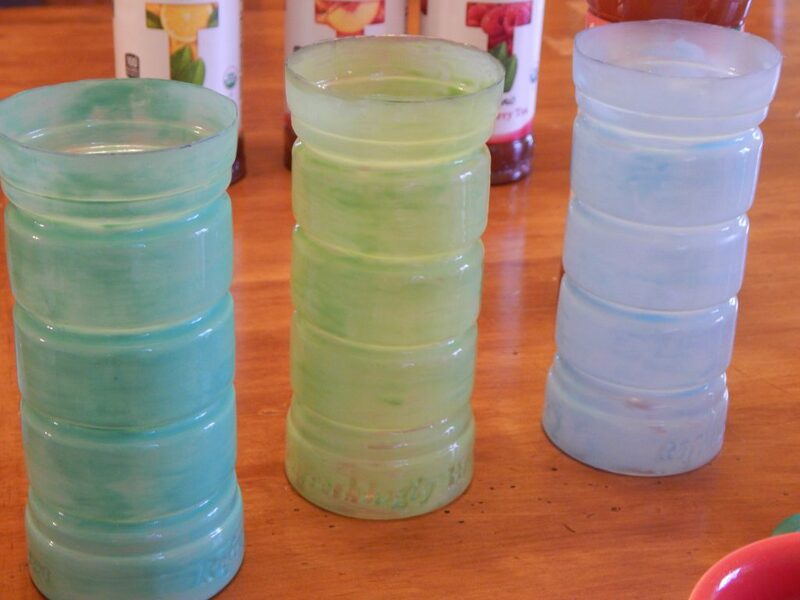 Want more inspiration for your tea and reusing the bottles? 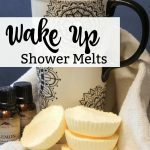 Head here and check out all the amazing ideas! What is your favorite way to celebrate Earth Day? How do you bring the outdoors in? 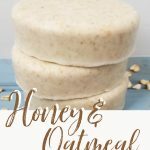 These turned out so pretty–I love how you used the glue to make them look like that!